This week I celebrate my 30 year anniversary of joining the recruitment industry. Day one of my career in recruitment was Monday 6 February 1989 at Accountancy Personnel (now Hays) 5-8 Glenn House, Stag Place, Victoria, London SW1E 5AG. Having departed Australia for Hong Kong on 19 December 1988 with a good friend of mine, we spent the next three weeks travelling by train through China, Mongolia and the old Soviet Union; Siberia and Russia, specifically. I arrived in London in mid January 1989, went to an Aussie party the following night, found a place to rent via one of the people at the party, moved in the next day, then spent the next week organising my work permit, National Insurance number and a few other things. The following week it became clear I needed a job, as I spending British pounds like they were Aussie dollars I was referred to a temp recruiter and she booked me in for an interview. Initially I spoke to an NZ-er, Alison Taylor, who ran through the basics. She had only started the job, she used to be a psychiatric nurse! She asked me whether I was interested in consultancy (what she was doing) which I said I was. She then said she would get her boss to speak to me. Her name was Terri Martin and low and behold not only is she Tasmanian but she used to live in Lindisfarne (the suburb of Hobart I was from). It’s a small world! Anyway we chatted for about 20 minutes talking about consultancy work. Terri said the main requirement was hard work (hours 8.30 am – 6.30 pm, 3 weeks leave in the first year) and the ability to communicate very well both over the phone and in person. All sounded pretty good, she was virtually offering me the job there and then. It was all a bit of a shock to me. Here I was going in hoping they could find me a job and they finish up virtually offering employment there. I said I would think about it and give them a call. When I got home I got a call from Alison who said Terri was very impressed and that she had teed up an interview with one of the directors, Eileen Clarke, for 9.30 am on Monday morning – they must be keen! After about 15 minutes of a cup of tea and reading the paper Eileen saw me in her office. Like all AP people she smiled a lot and was loud and bubbly. She asked me a few questions mainly to assess my confidence in my own ability and the way I handle people. She was impressed, I think, anyway she offered me the job, asked when I could start and explained the system of payment which is based around commission. There is a base wage of £5000, guaranteed at £10k for the first 3 months, then the rest comes from a combination of your own placements and what the offices does as a whole. The good old capitalist system – the harder you work the more you get – no wonder people don’t take lunch hours! I told her I was about 90% sure I would take the job but would phone them tomorrow with a definite answer. They were anxious for me to start on the next Monday as there was a training course starting. Immediately after the interview with Eileen I had an interview with Contiki, near Euston station, as a Sales Supervisor. At the end of the interview I was offered the job so suddenly, after being interviewed for two jobs and offered both, I had a choice to make. Today was the day I decided I decided how I was going to spend the remainder of my time in the UK. It is probably the biggest decision I have ever had to make about my own life. After calling home (to speak to my girlfriend) I was favouring the Contiki job. After I hung up I spent the rest of the day trying to make a decision. My head said AP, my heart said Contiki. At 5 pm I phoned Kim (who was to be my manager at AP Victoria office) who sounded a bit peeved I hadn’t made up my mind and said they wanted an answer tomorrow. I phoned home that evening. Mum was the only one home. She listened but basically wasn’t much help. She was concerned about me going straight into a permanent job. Then I finally worked out why the Contiki job was so attractive – the ego side of it. That decided it for me. I had to start at the bottom sometime and now as good a time as any- Accountancy Personnel would the lucky recipient of the affirmative phone call in the morning. Boy – what a decision. I only hope everything slots into place now. Oh, well if things don’t work out it will have been good experience – here goes nothing! Ross becomes a true London yuppie on Monday. Well, my first week at work, what an experience. I got to the office at about 8.50 am. The first thing that struck me was everything was so manual except the receptionist’s word processor. The morning was taken up with training my Sue Tetly a former manager who was just returning after a having a baby, to train the new recruits. It was two hours of high speed stuff, fairly mind boggling. 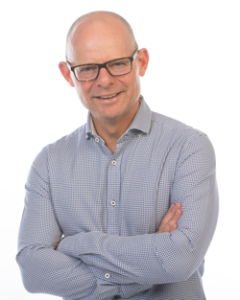 Without doubt I have got myself into a highly competitive industry, money is the bottom line nothing else matters – you are judged solely on your placements fees, nothing else. The afternoon was spent sitting, watching and listening, attempting to take it all in. Unfortunately I am really starting at the bottom of the pile as I know very little London geography, little about English education and not much at all about accounts. Basically the whole business is about speed and organisation combined with elements of ruthlessness. The worst aspect is that it is all manual. When we get computers it will all be totally different proposition (little did I know that computers on consultants’ desk at AP was still six years away!) . Vicky (perm consultant had gone for training so I sat at her desk and tried to do some of her work, not so successfully. First call of the day resulted in my head being bit off, oh well, that’s the way you learn I suppose. Wednesday was another Tuesday, looking after Vicky’s stuff again. I’m learning rather quickly at this point. Thursday was better, sat in an interview and had my own applicant, Joseph Fadahunsi, looking for about £14k. This was much better as I knew much more about the person I was trying to sell so it was easier to sell over the phone. Kim (my manager) was much happier as she could tell I was picking it up. It will take 4-6 weeks to really get into it but I feel reasonably happy at this point. Pay day as well – my first real pay, net £133, wasn’t much good though because I don’t have a bank account yet. Traditional for the team to go out on payday so we went to the pub. Friday was not so good, suffering slightly from the previous night. Good news at about 5 pm though when I scored an interview for Joseph and earlier in the day I scored a second interview for Mark (one of Vicky’s candidates) from the first interview I had arranged for him on Wednesday. Was going to go straight home but Sue (perm consultant, from Melbourne) talked me into going out for a drink with her. Week number two at work was a much more enjoyable experience than week one. I finally managed to get into some form of pattern. By the end of the week I was feeling much more confident about selling over the phone. Like all things that I do it very much relies on the confidence factor. Developing a rapport with clients is so important. I started to feel that I was doing this by the end of the week. Toward the end of the week there was a good vibe building up in the team. It was the last week of the commission period so we were really attempting to get some placements in after the previous week’s ordinary performance. Claire (perm consultant) was gradually handing her portfolio over as she leaves in three weeks. I managed to score my first placement on Thursday with one of her hand-overs, Laura Palmer. Only £7000 salary but a good start nonetheless. I feel absolutely exhausted at the end of this week. Each day is like sitting two three hour exams, it is very mentally draining. Definitely not the sort of job to do when you have a hangover! I suppose it can only get easier as it goes. 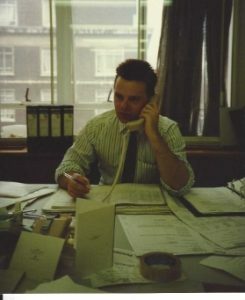 The photo of me, above, was taken at the AP, High Holborn office, in about August 1989. The photo to the left is of the Victoria perm office taken in July 1989. 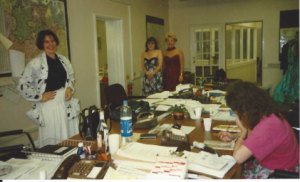 My manager, Kim, is in the foreground, Vicky (perm consultant) is to the left and at the rear (left) is Kathryn (perm consultant) and rear (right) is Eileen Clarke (Director). The annual Accountancy Personnel Ball was being held that evening, hence Kathryn and Eileen’s attire). My desk is where the empty chair is between Vicky and Kathryn. Agree. I can’t recall us speaking about the Eileen connection previously, Greg. I also had much respect for Eileen as clearly she was highly effective at her job and won universal respect from everybody else at AP. Great read Ross. Gosh you started in Recruitment 5 years before me, I started at Tristar in 1994. I learnt heaps and am grateful to Alan Singer and David Carman for giving me my start. My first IT placement lasted a week, but I learnt fast from there. Recruitment in Aus was different to the UK. I remember the Trading Room Floor at Robert Walters in 1998 and the sheer transactional nature of the job. The amount of activity in London was amazing and I remember my head spinning. Crikey, look at all that hair! In the background of the Victoria office photo is the interview room we used to sleep in when we missed the last train home. I blame AP London for the thinning of my hair and the loss of my eyesight! Loved reading this, Ross. It brought back a lot of (faded) memories. And yes, I too was offered my first job by Eileen but I was at The Strand office. Clearly she was a great judge of talent 😉 ! 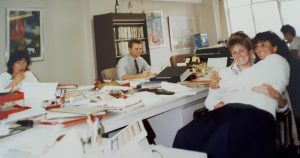 Thanks Juliette, I enjoyed the couple of weeks (September 1990) I spent in The Strand office before I headed back to Australia, via Egypt and Kenya. The past is a foreign country ….although in this instance I think the training you got is probably better than whats offered today. Good read Ross, it was great times. I’m actually still in regular touch with the Claire you referred to. Even funnier, I can remember when Ben Wood used to sleepover in the office after a big night out!! Wow, that’s great Sue that you and Claire are still in touch. Stewart sent me Kim’s contact details so I’m going to get in touch.